31. MOUNT SHASTA. (From Strawberry Valley, on the Shasta Route.) We shall have to be contented with a few statistics in our description of this famous butte, and assure our readers that any description, however graphic, will fail to give an adequate conception of its grandeur. SHASTA FROM STRAWBERRY VALLEY. Height of Main Peak ........ 14,440 feet. Height of Lesser Peak ........ 12,900 "
Elevation above Valley ........ 11,032 "
Elevation of Timber Line ....... 9,000 "
Distance in Air Line ........ 12 miles. There are five glaciers on its eastern slope ; springs of hot water very near the main summit; an immense crater nearly half a mile in diameter on the crown of the lesser peak; and there are chasms, cliffs, cataracts, and canons around and around it, of the wildest and most romantic character. 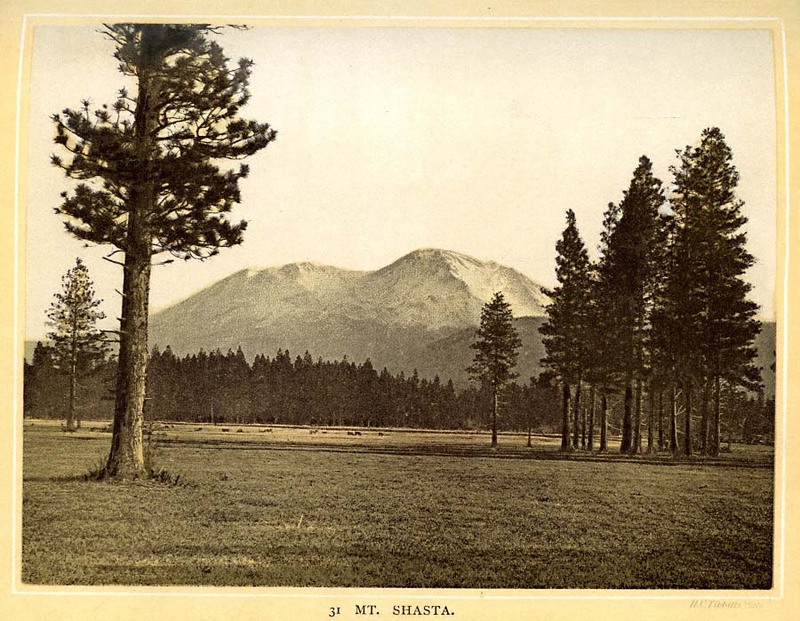 Shasta is grandly isolated from the main Sierra, and certainly looks to be, if it is not, by far the loftiest mountain in the United States. Good views are to be had of it from Strawberry and Shasta Valleys.